From time to time we have a special sale of a few Vrum bike older models that have been used at fairs and trade exhibitions. The models shown here have some minor marks and scratches and make use of a few components (such as the handlebar stem, or the pedals) that over time we have discontinued and changed with different products. Apart from the aesthetics, the bicycles are perfectly functional, have been on the road just for few kilometers, and come with a six months warranty. VRUM Unica (model 2015) in red color, sport preparation. Includes fixed frame, Zehus BIKE+ all in one hub. Shipping to selected countries in Europe. VAT included. The bicycle is in very good conditions, it has been used in fairs and test rides only. 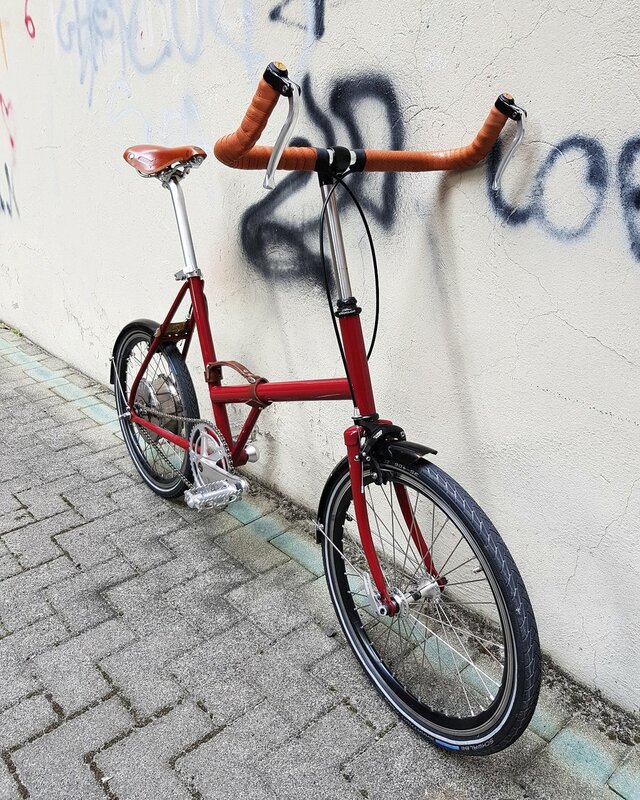 It mounts a bullhorn handlebar, non-foldable pedals and a Brooks Team pro leather saddle in a beautiful honey color.